Our absolute favorite! 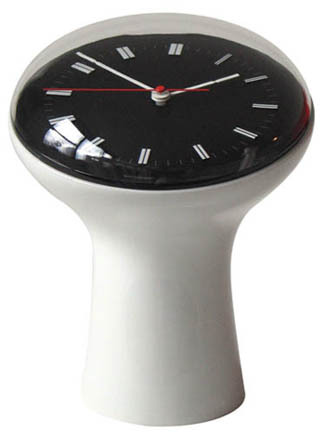 This fantastic and super luxurious clock was designed by Angelo Mangiarotti in 1956. He actually created this clock for an Italian Luxury Yacht. If you got an eye for good design, you will fall in love with it on first sight. This is not a clock you want to put in a corner, rather, it deserves full center piece attention. The quality of this clock is amazing and you will find nothing that will come close. The base of the clock is actually high quality porcelain! The clockwork mechanism consists of metal and the clock lid is made of solid acrylic glass. This is the same durable quality they used to produce them in during the 1950's!